I never knew unconditional love until I became a mom. When I gave birth to my firstborn daughter Annika eight years ago, all I could ever think about was how to provide the best for her. When I look at her, my instinct is to nurture her and make her happy. I thought I had given all that I could for Annika. You see, she was mixed-fed. I was a working mom and traveled a lot. I didn't have access to information about breastfeeding back then. Annika was not exactly the healthiest kid. She has been hospitalized twice before she turned 3 for varying degrees of dehydration. It wasn't until seven years later that I discovered I could have given so much more. Several years later, Elyssa and Kali came into my life. Elyssa was our preemie child, who we unfortunately lost six days after her birth. As a preemie, Elyssa needed all the help she could get. The NICU Department of Asian Hospital encouraged me to give breast milk as much as I can. Since she was born premature, I had no milk to give yet. I pumped and pumped religiously every 2 hours until my hands were aching. I worked hard to give Elyssa that precious colostrum. All I could think of was helping her survive, and I gave it all the effort my body could muster for it. We used to save every drop of milk that will come out from my pumping. We used a syringe to carefully draw in as much breast milk that we can. Unfortunately, Elyssa passed and went up to heaven. A year and a half after Elyssa passed, we were blessed with another daughter. We named her Kali. This time, I was determined to give her the best nutrition I could possibly offer. I researched voraciously about breastfeeding. I made it a goal to have zero formula milk for my little one. Armed with information, I discovered breastfeeding was not such a difficult journey after all. With commitment and effort, it is entirely possible to exclusively breastfeed my precious one. Although there are countless articles online about the benefits of breastfeeding, a lot of mothers out there still opt to formula feed. In statistical data given by CDC, only around 38% of babies were breastfed exclusively through 3 months. A mere 17% were breastfed exclusively through 6 months. This is such a sad number, considering that breastfeeding should be the first option available to a mother when feeding her child. Breastfeeding is convenient and hassle-free. No need for bottles, sterilizers or any other equipment to feed one's child. The past six months, I am happy that I have exclusively breastfed my little Kali. She is growing up healthy and strong, and I am amazed that her nutrition merely comes from me! It wasn't an easy journey from the start. I had to make effort to establish my milk supply. After my c-section, I dragged myself groggily to the nursery to help Kali latch on to me. For the next three days, my milk didn't exactly come in. The doctor assured me it was okay to wait until my milk finally came in. Just in case I needed it, she handed me a prescription of formula milk. Determined to stick to my goal of no formula, I had Kali latch and latch until my milk came. Even if my little one was sleepy, I would have her latch strictly on a two-hour interval. With God's grace, Kali and I were able to make our breastfeeding tandem work. As I look at my little Kali, I am happy to see her happily full and milk drunk after a feeding session. She would cling to me and hug me while she nurses, and it is one of the best feelings in the world. It makes me feel content seeing that Kali feels she is loved through breastfeeding. I know she knows in her heart that she can depend on Mommy. Just like how she was nurtured while she was in the womb, that experience continues on with breastfeeding. I know that breastfeeding is the best form of nutrition I could possibly give, simply because it is God-designed. Before any formula and other substitutes, God only intended for mothers to breastfeed their children. And when God designs, it is always perfect. When I look at mommies I know who resort to formula milk for their own reasons, I wish I can let them experience the joy of breastfeeding. Honestly, it doesn't really take a lot of effort. It just needs commitment. For me, breastfeeding my baby is the highest form of love I can give her at this stage of her life, and I am grateful I am able to provide it to her. 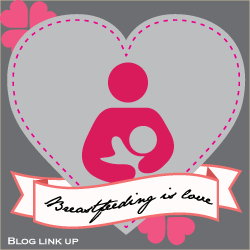 This post is part of the "Breastfeeding is Love" blog link up party. Please feel free to visit other posts from fellow mommy bloggers on the joys of breastfeeding! Wear and Nurse Baby: Breastfeeding is Love! Why I Breastfeed. @Louisa: I absolutely agree with you that it's definitely worth the sacrifice!